Ninth Air Support HQ, May 14—American fighter pilots are sleeping in tents, washing and shaving in tin hats full of cold water, getting their briefings in an abandoned cowshed and then flying out to meet the Luftwaffe over Europe. Daily as the air offensive over the Continent steps up to invasion fury, airmen of this command-the infantryman's air force-are flying from, conditions as primitive and barren of comfort as they are likely to encounter before the armistice. Pilots and ground crews, colonels and privates are living and working under conditions which permit them to tear apart their base, move planes, tools, supplies and everything else 100 miles and be flying against the enemy again within 12 hours. It's not quite the Hollywood or PRO idea of the fighter pilot. Field conditions find Ninth Air Support fighter pilots living in tents, shaving in ice water. 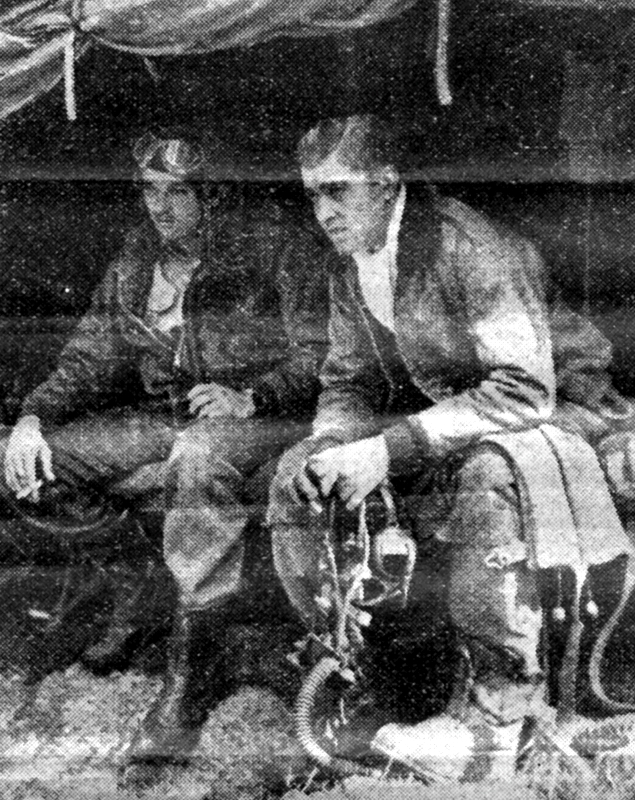 Capt Jack Bradley, of Brownwood, Tex., and Glenn Eagleston, of Alhambra, Cal., Mustang Aces, kill time between briefings and take-off. Here within strafing distance of Nazi fighter fields, beneath the pink blossoms of old English apple orchards, entire Mustang and Thunderbolt groups are operating just as they expect to when D-Day comes for them and they move to the Continent. And neither joking nor subtly griping, virtually every man in the force says he likes it better than when they were living in Nissen huts, eating in heated mess halls and flying from paved runways. Long strips of green meadowland which have fed English cattle for hundreds of years are laced with spiked sheets of heavy chicken wire fencing on jute mats, and from them the P51s and 47s are flying each day to strafe or bomb or cover the fighters. Line crews service the fighters from tents beside the wire runways, bombs are piled in the shade of hedges, and an occasional chicken or maybe a sheep wanders up to the doorway of the trailer housing operations and waits for a handout. Men who a year or so ago were taking showers in appropriated resort hotels back home are bathing - when they get a chance - in a battered fighter belly tank with a hole in the top and a fire beneath it to heat the water. Some of the more elaborate layouts include a couple of tanks rigged up where the sun can beat the water in them, and a pipe running down to a shower stall made out of the packing boxes in which the fighter belly tanks come. 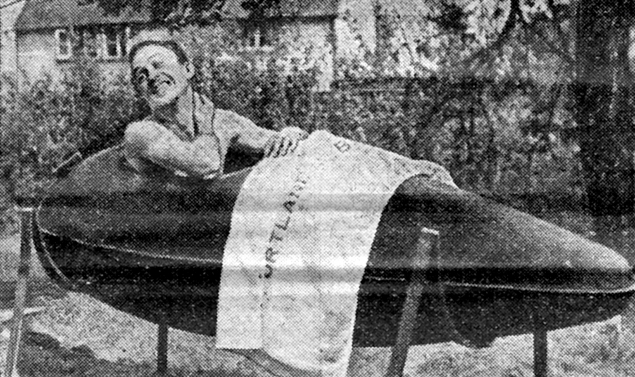 Singing in the bathtub for Ninth Air Support fighter pilots living under field conditions means singing in an auxiliary gas tank, with a hole cut in the top and water heated by a bonfire, the way 1/Lt. Don McDowell, of Lincoln, Neb., is doing. So that they'll know how to use them, and to insure constant remembrance hat they're within strafing distance of Jerry, every man in the command has a foxhole just outside of his tent, although the English touch is generally there in the person of the inevitable small boy waiting beside it with the equally inevitable question about gum. When they moved into these field conditions, aces with ten or 15 enemy aircraft to their credit lived and ate cheek-by-jowl with the privates and sergeants who serviced their planes. After a month or so, they got separate messes, but it's still the same food," cooked on gasoline stoves, and when the mornings are so cold they have to break the ice in their helmet-wash-bowls, they sit down to breakfast in flying jackets or overcoat and hats and sometimes gloves. Trailers form an integral part of their mobile existence, all repair machinery which can’t be set up in tents or in the open being housed on trailers, as are group and squadron operation and the various staff units. There's one house in the outfit - an old farmhouse taken over by the air force - but even there electricity is rationed and there still isn't any hot water. "Everyone feel that field conditions bring us so much closer to the end of the war - that is, toward the day when we go over there and clean up the job." All the groups have pooled ideas as how best to operate in the field. Operations has devised sectional maps to replace the big maps of normal briefing rooms. Flight control has worked out a trailer with an 'Old bomber turret in the roof to regulate traffic on and off the runways. Above the blossoms of the orchard poke fish-pole radio aerials and weather vanes of radio and meteorology trailers. The officers' club and the enlisted men's club are in one-time farm buildings – a cowshed and a chicken house. The troughs are still in the floor of the cowshed. Despite the elemental conditions, however, each club contains the inevitable slot machine indigenous to air-force base. Field conditions haven't hurt the fliers’ score, “We’re doing as well or better than ever," says 1/Lt. Lowell K. Brueland, of Callendar, Iowa, P51 pilot. “The boys feel this getting closer to things." It’s a basic item, but probably the final blow to destroy the Hollywood concept of Fighter Pilot, vintage 1944, stands in a clump of apple trees in most squadron areas: A dozen or so poles, five feet high more or less, around which is strung, in stockade fashion with a right-angle entrance, a shoulder-high screen of brown burlap bagging. And that’s a long way from the gleaming tiles of the Roney Plaza or any place else. Since the last world war, Stars and Stripes newspaper has published continuously (1942 in Europe; 1945 in the Pacific). Stripes reporters have served right beside American soldiers, Marines, sailors and airmen in Korea, Vietnam, the first Gulf War, Bosnia, Kosovo and Middle East. It also has covered the military’s humanitarian efforts around the world.